This delectable and witty mystery introduces Rosie "Aunty" Lee, feisty widow, amateur sleuth, and proprietor of Singapores best-loved home-cooking restaurantAfter losing her husband, Rosie Lee could have become one of Singapores "tai tai," an idle rich lady. Instead she is building a culinary empire from her restaurant, Aunty Lees Delights, where spicy Singaporean meals are graciously served to locals and tourists alike. But when a body is found in one of Singapores tourist havens and one of her guests fails to show at a dinner party, Aunty Lee knows that the two events are likely connected. The murder and disappearance throws together Aunty Lees henpecked stepson, Mark, his social-climbing wife, Selina, a gay couple whose love is still illegal in Singapore, and an elderly Australian tourist couple whose visit may mask a deeper purpose. Investigating the murder are Police Commissioner Raja and Senior Staff Sergeant Salim, who quickly discover that Aunty Lees sharp nose for intrigue can sniff out clues that elude law enforcers. 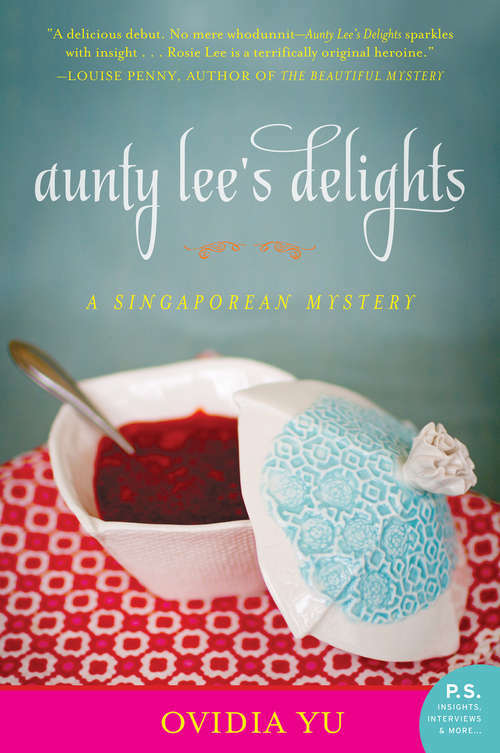 Wise, witty, and charming, Aunty Lees Delights is a spicy mystery about love, friendship, and food in Singapore, where money flows freely and people of many religions and ethnicities coexist peacefully, but where tensions lurk just below the surface, sometimes with deadly consequences.